You have to be going there on purpose, to this tiny town on the banks of the Pecos River south of Santa Rosa. It’s so unknown that Google maps will either direct you to Luna, New Mexico, which isn’t it, or will send you to what looks like more-or-less a random location. The only way I even knew about it was from reading one of those cheerful “Welcome to Santa Rosa” booklets once at a restaurant. (If you want to go, just take South 3rd Street from downtown Santa Rosa. It’ll change names to State Highway 91, County Road 2P, and County Road 3C by the time you get there. This is the view from a little cemetery on a hill east of town. 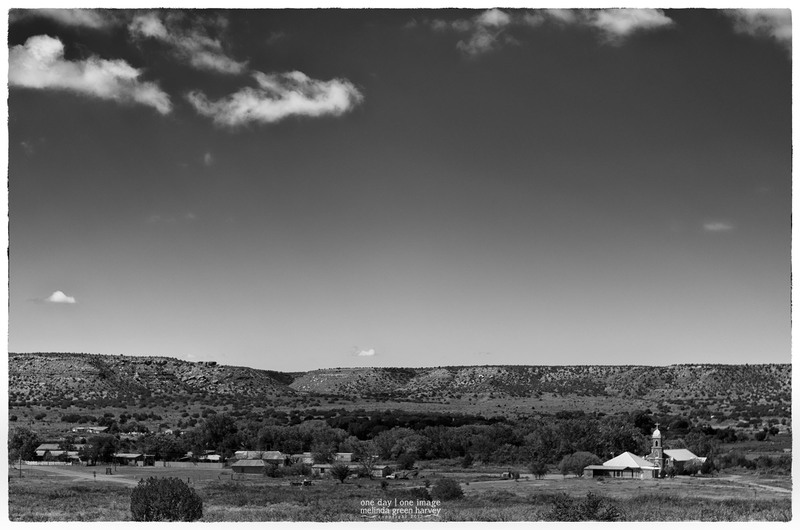 Posted on February 6, 2017, in Photography and tagged 365 photo project, black and white photography, melinda green harvey, monochrome, new mexico, NIK Silver Efex Pro 2, one day one image, pecos river, photo a day, photography, postaday, puerta de luna, puerta de luna new mexico, santa rosa new mexico. Bookmark the permalink. 7 Comments. and put it in google maps you can bring it up. I have to say that your photo looks much nicer than google’s street view. It’s kind of a cool town – looks like maybe some leftover hippies live there now, and a priest. I suppose it’s possible that the priest is also a hippie. Way too good ! And from a cemetery. Does this old cemetery chaser good. I would be happy to sell you one. Please contact me at melindagharvey@gmail.com. Hi Melinda! I sent you an email yesterday — Maybe in your spam?